Nightly buffet dinners offer you free flow beer and soft drinks. 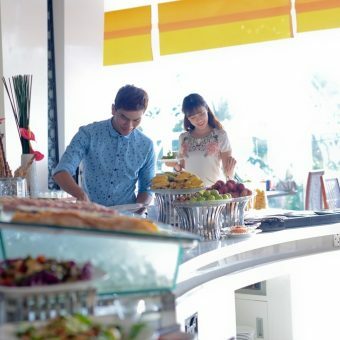 Visit The Square, one of the best buffet restaurant in Nha Trang. Novotel Nha Trang’s Executive Chef, Nguyen Le Hoang Phat welcomes you to The Square restaurant with his team of culinary experts. Enjoy fresh dishes influenced by local and international cuisines, carefully paired to create mouthwatering experiences. Novotel Nha Trang introduces its executive chef Phat Nguyen with a passion for creating memorable dining experiences for guests. Since 2008, Phat has enriched his experience by working at numerous AccorHotels properties. Now heading the Novotel Nha Trang’s restaurant, the champion of Bocuse D’or – Vietnam 2014 describes his style of cuisine as fresh and simple, with influences of both the traditional and international. This is mixed together with an enthusiasm for food and a desire for an excellence.